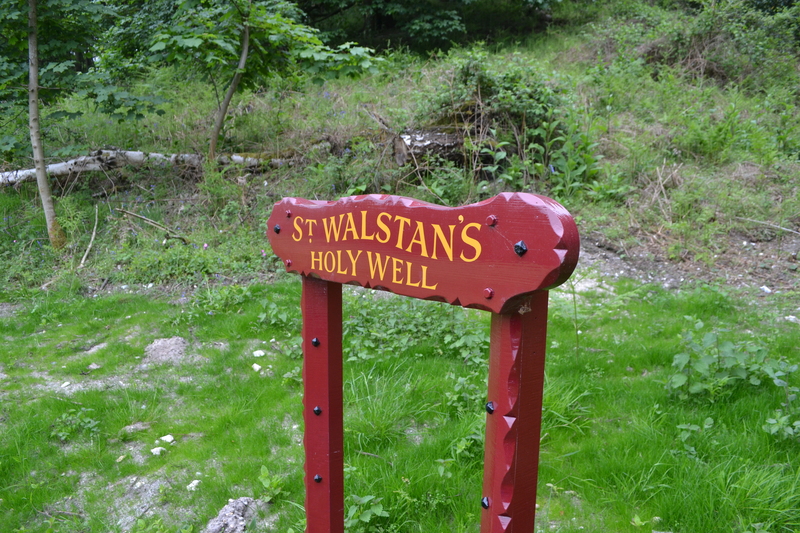 If holy wells had a token head, a site which makes the non-enthusiast an enthusiast, it would be St Cybi’s Well. Why? Firstly, it is well signposted, secondly it is well looked after, thirdly it is well written about – why all of these? This is because St. Cybi’s Well is a rare thing amongst holy wells – a site looked after and managed by a heritage organisation – CADW. Now although this may make you think that means it is sanitised and over populated…nothing can be further from the truth. Despite its CADW guardianship this is still a remote site, one still needs to traverse footpaths, cross muddy fields and still possibly get lost. This still is not an ‘exit through the gift shop’ site – there are no facilities at all in fact. It remains an eerie isolated place. I have been there a number of times and even at the height of summer it is still has the feeling of a special place however many people are there. Its walls echo a time long gone and it is captivating in its ruination. 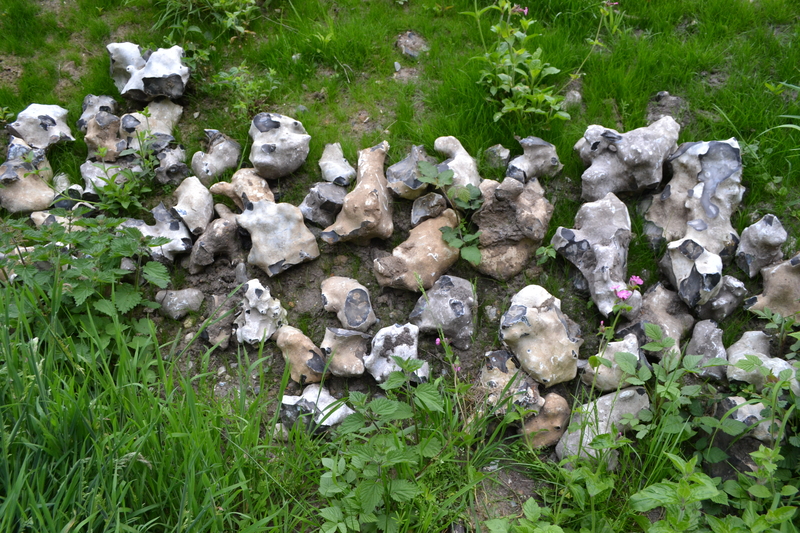 What greets the visitor is quite unlike other holy wells in many ways, for these are the remains of a commercial enterprise – a house which served a guardian, a bath, well and even a latrine – fortunately down river – useful but often missing today from most holy well sites! The house itself is thought not be that old dating from around 1750, but were thought to have been built by the then landowner a Mr. Price to capitalise on the known properties of the well. A Cornish man descended from it is thought a Roman military leader of minor King and his mother was thought to be the first cousin to St. David. A much travelled man said to have be taught religious studies in France and travelled even to Jerusalem and Rome. When he returned to Cornwall becoming the leader of a failed uprising which forced him to travel northwards, first to South Wales and then to Ireland. He was not received well in Ireland being involved in territory squabbles and ended on the Lleyn Peninsula settling and founding the church of Llangybi. The spring is said to have arisen in a classic fashion for holy wells, him striking the ground with his staff and the spring arising! A catalogue of cures and a sacred eel! The well here appeared to cure one of the widest range of ailments from warts, scrofula, scurvy, lameness to even blindness, one 18th century account telling of how a man blind for 30 years bathed his eyes for over three weeks in the well’s water and was cured. It was also used to love predictions. This was done by using a handkerchief. It would be floated on the water and somehow would tell who their love would be. 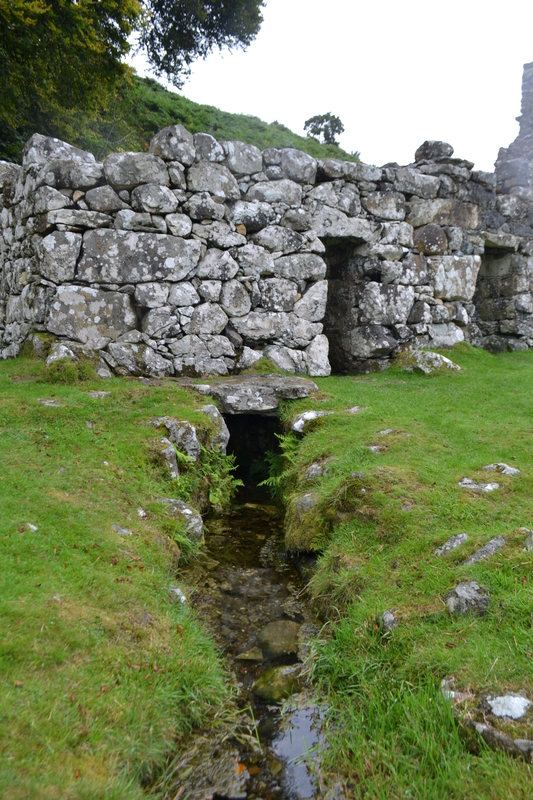 For those unable to get the cure on site, water was often placed in bottles or casks. Jones (1954) in his Holy Wells of Wales even tells of smugglers being challenged by exercise men claimed the casks contained not spirits but holy well from this well! A specific ritual arose for its use involving patients having to bathe in the water once or twice a day for seven to ten days, then sleep in a room in the adjoining cottage where they would be given the well’s water mixed with an equal volume of sea water. If the patient became warm in their bed then the treatment had worked. Offerings were left at the church being placed in a box called Cyff Gybi and crutches were found around the well; left by the cured. Whilst I was at the well, I slipped and ended up falling into it – not enough to get too wet but enough to hopefully awaken its famed resident – it still remained. This was a large eel. It was claimed that if the patient stoop bared legged in the water the eel would effect a cure by wrapping around their legs. No eel appeared. Apparently it was removed some time ago and it was said the spring water’s powers was lost! Certainly, what has not been lost is the magic of this site. Even on a day when the rain is torrential, there is still a mysterious and tranquil air to this site. Worth a restful moment on any day. Great pleasure yet again to have a guest blog post from one of the great experts in the field James Rattue. Author of The Living Stream and his indispensable local field guide books – Surrey, Buckinghamshire and Kent, together with gazetteer articles on Dorset Leicestershire and Oxfordshire and some first contributions for both series of Source – although he does stress they need a re-evaluation! From a recent holiday in the Channel Islands he has provided us with a unique overview of Jersey sites…or rather his attempt to find them! Our recent sojourn in Jersey turned out to be another on which I managed to visit precisely no holy wells at all, although this wasn’t for lack of looking, nor not having a car to get around (the island bus service is astonishingly efficient and can take the visitor to within walking distance of most places). In fact, the dearth of sacred wells, as such, on the largest of the Channel Islands is a distinct puzzle. There were, apparently, a number of healing springs on Jersey. La Fontaine ès Yeux at Grève de Lecq was good for the eyes, an ability (as usual) shared by several wells, including the most resorted-to site on the island, La Fontaine ès Mittes on the headland of La Belle Hougue – whose name might refer to some foul-smelling property, or be a corruption of ‘l’Hermite’. Other sites were the refuge of supernatural beings: there were fairies at the Fontaine dé la Bouonnefemme at St Mary and the Fontaine ès Fées at La Belle Hougue, an unnamed monster at Les Puits dé Maufant, and the dreadful being called the Cocangne which inhabits potentially any well, spring or pond on the island (especially, perhaps, the one that gave its name to La Cocangne in St John parish). 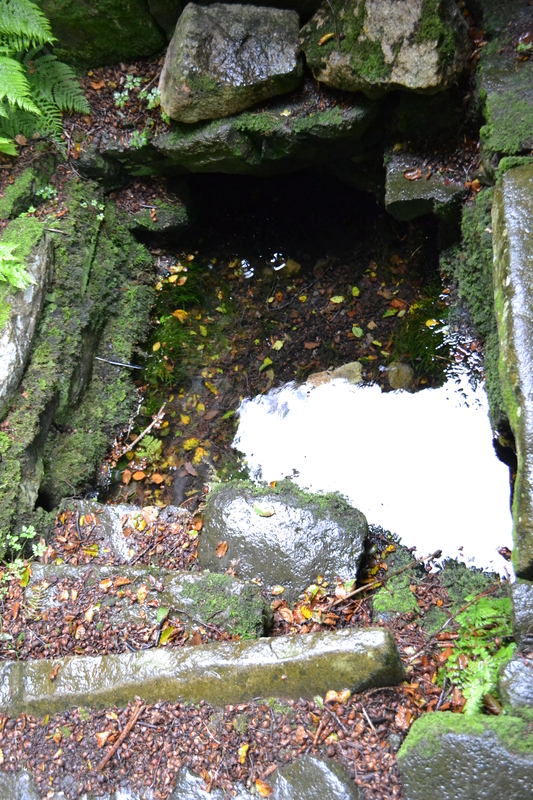 The most celebrated well of all, out on the north coast rocks near Sorel, goes under various names: La Fontaine dé La Princesse, Lé Pits d’la Tchuette or, intriguingly and so far inexplicably, Lé Pits d’la Tueuthie – Well of the Killing Ground. Here at this tidal pool, the legend states, the fairies wash, and woe betide any human who sees them. 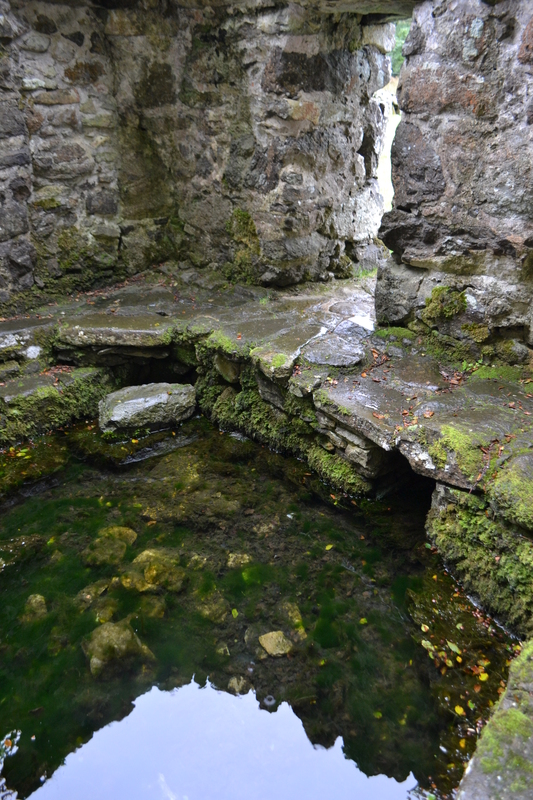 Yet another alternative name, La Lavoir dé Dames, links the site with the other lavoirs around the island – walled pools fed by streams or springs constructed to wash laundry or people, some of which I suspect may have originated as holy wells. But holy wells proper – there seems to be but one. La Fontaine de St Martin is in the parish of St Lawrence in the middle of Jersey, although interestingly two different online sources have photographs of what seem to be entirely different sites! If the Société Jersiaise’s version is correct, this well was probably rebuilt in 1734. And that seems to be it. 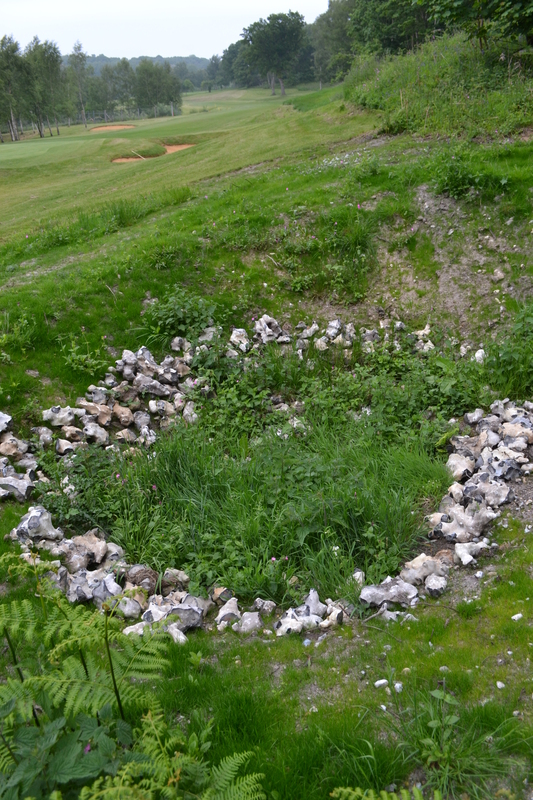 There is a well at the Neolithic site of La Hougue Bie sometimes claimed as a medieval holy well, but it seems to date no earlier than the 19th century, with an old well-head moved here and placed on top in 1925. Of course Jersey is small: but Guernsey is smaller, and that rival island had at least seven holy wells. St George’s Well at St George is perhaps the best-known, possessing a series of interesting legends, but there were also wells of St Peter and St Mary at St Peter Port; St Anne at Kings Mills; St Clair at St Andrews; and St Martin in Forest parish, as well as a spring near St Germain’s chapel at Castel very probably dedicated to that saint. At first I wondered whether this disparity might be due to religious differences between the islands. Despite the Catholic culture of the French mainland being so close to hand – and being part of the diocese of Coutances in Normandy until as late as 1569 – Jersey was very early affected by Calvinist ideas, and provided a refuge for Protestants driven from France itself. Despite being a possession of the English Crown, Jersey churches worshipped according to Jean Calvin’s French-language Ecclesiastical Prayers from the 1540s until 1620 when the English Book of Common Prayer was translated into French. Even after Anglicanism was officially imposed the tenor of Jersey religion was far more thoroughly Calvinist than in England. However in fact Jersey and Guernsey were no different in this respect. GJC Bois, author of Jersey Folklore, lamented that so much of the island’s legends were recorded so late and that there had been no equivalent of Guernsey’s Sir Edgar MacCulloch, whose manuscript collections in 1903 formed the basis of Guernsey Folk Lore with its details of the wells described above. But MacCulloch had related that the first record of St George’s Well was in 1408, and that the two holy wells of St Peter Port were ‘mentioned in early ordinances of the Royal Court’. Why weren’t Jersey’s wells so recorded? Perhaps most puzzlingly of all, why does the doyen of Jersey saints, St Helier after whom its capital is named, have no well? He has many other elements of a classic well-saint’s legend: a hermitage, miraculous healings, a martyrdom at the hands of the ‘Vandals’, and he is a cephalophore – having after his decapitation carried his head some distance, where it was subsequently found before being taken away for enshrinement. What is missing is a spring: neither a hermit’s well used during Helier’s lifetime, nor a martyr’s well which arose where the saint’s head fell. Helier is something of a made-up saint: certainly the details of his Life, written at an unclear date but certainly later than the 11th century, were provided from standard narratives of the sort to flesh out the bare bones of the saint’s name and the hermitage site. This can only have meant that there wasn’t a well to build into the story. Helier has wells in his name on the Normandy mainland, but not, apparently, on Jersey. I don’t have any clear rationale to offer: it could be that there are records of holy wells on Jersey waiting to be discovered in local archives, but in that case we wait. The closest I got to seeing well was this nice, albeit dry, fountain near the beach at Grève de Lecq, which looks rather like one of the public fountains provided around the island in the 18- and 1900s. It has the battered suggestion of lettering on the lintel stone above the niche, and, just to the left, what looks like the faint remains of the word LADIES. Ladies Well? or, perhaps, a direction to a now-long-vanished loo?